Edinburgh City manager James McDonaugh is continuing to look up rather than down the table ahead of tomorrow’s trip to Shielfield to take on Berwick Rangers, even after Cowdenbeath gained ground on both earlier this week. City’s 3-0 home loss to Clyde – their first league defeat in five games – coupled with Cowden’s 2-1 win at Stenny and Berwick not playing meant the Blue Brazil cut the gap to the two sides above them to nine and ten points respectively. While it still remains an outside bet that the Fife club will overhaul either City or Robbie Horn’s Rangers, another win for Gary Bollan’s men at the weekend could make for a more interesting final few weeks of the Ladbrokes League Two season. McDonaugh prefers to see tomorrow’s encounter as an opportunity to move further ahead of Cowden and Berwick, who still have two games in hand on the visitors. With the Wee Rangers being the only side not to have beaten City this term, he and his players will head down the A1 with a justified confidence, despite the heavy midweek defeat. “I’ve always tried to look up the way,” he said. “It’s more of a positive thing rather than always looking down and being negative – even if you say the words ‘looking down’ you’re thinking negatively, aren’t you? “As I’ve said to the players, I’ve always thought Cowdenbeath were going to start winning games. They’ve got a good manager, some good players and not many teams go through the season only winning one game, so they were going to come good at some point. “We’ve still got that gap, though, and by and large, we’ve both got the same teams still to play so it’s still in our hands. Tuesday night was our first defeat in five games. It seems like a disaster because of the manner in which it happened, but we’ve got to look at the bigger picture. 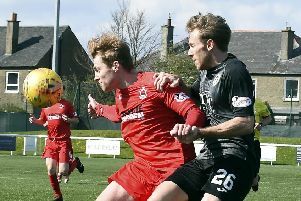 A win at Shielfield would go some way to restoring the positive vibes that had been emanating from Ainslie Park in recent weeks. “It’s a bit of a six-pointer,” admitted McDonaugh. “If Berwick win and Cowdenbeath win again then we’re closer to Cowdenbeath and Berwick go back above us. To ensure they finish top of it, McDonaugh’s players will need to perform far better than they did in the midweek defeat at the hands of Clyde. The Broadwood side ran out comfortable winners, even looking the more accomplished side when down to ten men for the latter stages. “It was a bad night,” McDonaugh reflected. “I think we got what we deserved on Tuesday. Clyde thoroughly deserved the win and by that margin as well. “I said to the boys that we’ve seen teams before with leads in terms of points crumble a wee bit. I don’t think we’ve crumbled. “Clyde deserved their win, but with the score being at 3-0 and until about five or so minutes after that goal, we’ve missed chances and they’ve taken chances. I don’t think there’s been that much between the teams at that point.